Studies of Americans’ unconscious beliefs shows that most people — white and black — think black people are dangerous and both average folks and police are quicker to shoot black than white people. Partly, it comes from the media. A new study by Color of Change found that, while 51% of the people arrested for violent crime in New York City are black, 75% of the news reports about such arrests highlighted black alleged perpetrators. Each time we see a black person on TV who is linked with a violent crime or portrayed as a criminal, the neurons in our brain that link blackness with criminality fire. The same for people of other races. The more often a link is triggered, the stronger it becomes. Disproportionate reporting like the kind captured in this study make the neural links in our brain — it’s actual physical structure — reflect the racism inherent in the reporting itself. These associations, unfortunately, are pre-conscious. Those neurons fire faster than we can suppress them with our conscious mind. So, even if we believe in our heart-of-hearts that these connections are unfair or untrue, our unconscious is busy making the associations anyway. Biased reporting, in other words, changes the minds of viewers, literally. Lisa, I think there is certainly some bias in how the media presents white/black crime suspects, but the Iowa burglaries are a bad example. The presentation in that case is more likely due to laziness on the part of the newspaper than anything else. For the (white) University of Iowa students, their team PR photos are freely available and likely one of the first images that pops up in a web search. On the other hand, it takes a bit more effort to get a mugshot, but that might be the only photo available for someone who doesn't have PR photos sitting online. It's certainly possible this is an example of racial bias, but I think it's far more likely that it's just a small-town news outlet using whichever pictures are easiest to acquire. I'd bet that if the black suspects had been university of Iowa athletes and the white suspects had been more anonymous people, the photo situation would have been reversed. The methodology of the study conducted by Color of Change seems well designed. I thought because it is an advocacy group it might have been rigged but I found no evidence of that. I don't know what is the reason for the disproportionate coverage and doubt it can be explained by simple racism; however, on one level that doesn't matter. Lisa's primer on neuronal connections is over simplified but not really incorrect. 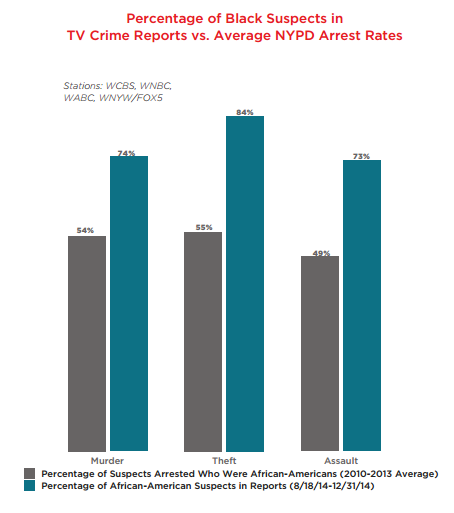 These stations should evaluate why they are disproportionately featuring black crime and unless there is a legitimate news reason, which seems doubtful (more likely the reason has to do with assumptions about marketing drivers and viewership), they should adjust their coverage to achieve better balance or they should continue to be called out. There is a silly fantasy among Americans that the media--the news--is managed by "journalists" that are engaged in some kind of life mission to keep us fully informed and tell us the truth about what's going on. Now really. The media exists to sell us beer and pantyhose. They do so by hooking us on fear, extremes and controversy. Now you know; lets move on..
Not to take away from your argument which is a valid one at the least. It should be noted that these reports were also taken in Iowa where their wrestling program is high respected and cherished by most in the area. 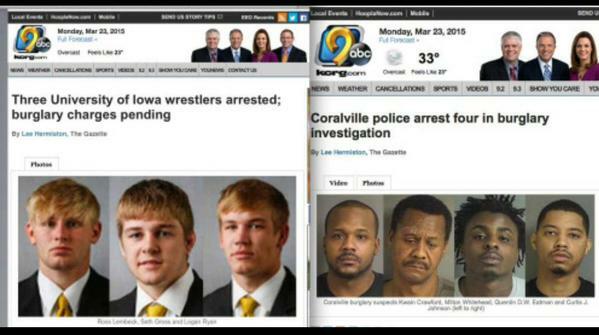 Media bias would happen the same way if athletes of another highly respected sport in an area were arrested. Its more than a racial favoritism here its similar to when a celebrity or someone part of a larger respected entity makes a mistake its simply a mistake in their young lives. When its anyone who else who doesn't reach a middle to high ranking status group its a crime and they are a criminal. So interesting, love this blog simple enough for layman's terms and advanced enough to intrigue those who study sociology! Simply phenomenal! It's funny, I look at media reporting of crime and I see the exact opposite phenomenon. For example, what if the media reported that there would be practically no murder in New York City if there were no blacks or hispanics there? That's kind of funny. A cop shoots a black guy that's high on PCP and is holding a knife, and the picture shown of the black guy is him in his high school graduation gown. The picture of the cop is him holding a club with an angry look on his face. I heard about it on the radio, "White cop shoots black male." Of course, the races of the individuals are obviously the most important thing ... when it can benefit the liberal agenda. Have you heard about Zebulum Lael James, who shot two white women? Funny, he's not on any major news sites, and when he does appear race isn't usually mentioned. Don't believe this bs. nIggers are murdering white people on mass and the media is giving them cover. If a demographic that accounts for 50% of the city's crime is only 25% of the city's population, are you surprised to find that those who were investigated for crimes and not charged are predominantly from that demographic too? And let's face it: New York is gentrified - just like the safe little town you are reporting from, Occidental College, Eagle Rock, Los Angeles, where there is a 1.8 percent black population - so if you are in an area where crimes are commited and one of the suspects in the investigation happens to be from a black area and the crime took place in a black area, does it not follow that any additional suspects will also be blacks? The second part of your argument, with the magazines, shows two examples of arrests. One says there is an investigation pending and the other says... essentially that charges are pending because there is an investigation. How is that not exactly the same thing? Do you need boilerplate in media to assure you that no nationwide discrimination conspiracy against blacks exists? Or do you insist that there is a conspiracy against blacks because the media used school photos that could easily match the suspect instead of mug shots - when actually, if you think about it, the school photos are more likely to create a stir in the community and shame the individual. Furthermore, you are comparing student athletes to ordinary people who may even be older. Is it not just as likely that there could be a wealth and stature bias? What evidence is there that there is anything other than that? incorporate promiscuity with some strange notion of "female liberation"
That you got a Ph.D when the neurons clearly aren't firing is the only conspiracy going on, dear. meri choot mai sona hai?